Royce White is a great basketball player. He led his Iowa State team in every major statistical category as a sophomore and was a lottery pick in last year's NBA Draft, all while suffering from a serious anxiety disorder. He's currently in the throes of trying to work out a mental health protocol with the Houston Rockets (the team that drafted him) so that he can feel comfortable playing. White was recently interviewed by Chuck Klosterman for Grantland.com, and had some very revealing things to say. CK: Well, then what's the lowest level of mental illness? What is the least problematic behavior that still suggests a mental illness? RW: The reality is that you can't black-and-white it, no matter how much you want to. You have to be OK with it being gray. There is no end or beginning. It's more individualistic. If someone tears a ligament, there is a grade for its severity. But there's no grade with mental illness. It all has to do with the person and their environment and how they are affected by that environment. RW: Here's an even tougher thing that we're just starting to uncover: How many people don't have a mental illness? But that's what we don't want to talk about. CK: Why wouldn't we want to talk about that? RW: Because that would mean the majority is mentally ill, and that we should base all our policies around the idea of supporting the mentally ill. Because they're the majority of people. But if we keep thinking of them as a minority, we can say, "You stay over there and deal with your problems over there." CK: OK, just so I get this right: You're arguing that most Americans have a mental illness. RW: Exactly. That's definitely correct. CK: But — if that's true — wouldn't that mean "mental illness" is just a normative condition? That it's just how people are? RW: That doesn't make it normal. This is based on science. If there was a flu epidemic, and 60 percent of the country had the flu, it wouldn't make it normal. White has hit on something here, something that Christians have always known. Despite Klosterman's seeming confusion, what White is talking about is an idea as old as Christian theology: original sin. Humans all have a problem, and even though it's spread evenly throughout the entire population, it's still a problem. In other words, it's normative and problematic. We like to think that it's mostly those "other" people who have a problem. As White says, it comforts us to be able to shunt them over to a corner to deal with the problems that we claim we don't have. This is the tragic genius of Jesus' Sermon on the Mount: he takes all our problems back to first principles (it's not murder, it's anger; it's not adultery, it's lust; and so on) tearing down our ability to think ourselves "illness-free." 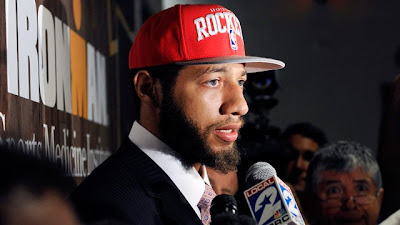 The church should look like Royce White's America: he would have us "base all our policies around the idea of supporting the mentally ill." Our churches should base all their policies around the idea of supporting sinners by proclaiming the arrival of a Savior.